Catch The Window! : 17 Minutes of Creativity!! This is for all you TIVO-ers - what does "Ace of Cakes," "LA Ink," "Simply Quilts," and "American Chopper" all have in common? Creative outlets for the perpetually homebound. While running through laundry and feeding Baby Sam, these pre-recorded programs let me in to the underbelly of so many artistic genres - and I love it! This useful knowledge helps me to connect with my fellow man. Just last week I was in 'Jersey with my mom - our sandwich chef had a huge tattoo of the green Martian from the Flintstones???? (yes, it was kinda ugly), and I asked him about it; coloring, cost, and how far he went to see his tattoo artist. Mom was shocked that I would know so much about the forbidden art of tattoos. Well, I learn a lot on tv: Kat Von D, formerly of Miami Ink, is one of my preferred artists and I love her fetish with Beethoven. I'm not getting one, mind you, but it's so interesting to see the reasons and objects that entice most people into getting a tattoo. Lots are missing a loved one, and others are just plain scary. Very emotional show. 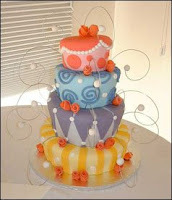 Ace of Cakes is my latest and most favoritest. It's like Cakes on Crack. Duff Goldman gets out of cooking school, and decides to combine his love of fondant with his welding know-how. The kid is two years younger than me, and making a splash on the food network. From rats to radiant wedding cakes, chinese takeout and flooded houses, he pushes the boundaries of "let them eat cake." His harlequin-type cakes are my favorite, and the construction process is fascinating. My sister and I would watch multiple tivo'd episodes, and always end up wanting some cake. YUMMY! 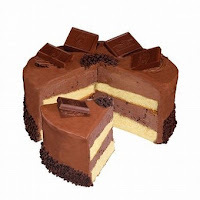 It is a great excuse to go out and get a Cold Stone cake. "We were just watching Ace of Cakes and wanted some good cake . . ."
Simply Quilts and American Chopper are now my old standbys. I've watched about all the episodes, and have gleaned all I can from their once-edgy creativity. I can tell with a fair amount of accuracy which episodes show Alex post facelift, and also when the Teutuls' business takes off and they start to make it big - they start driving Humvees and smashing into walls with trucks. 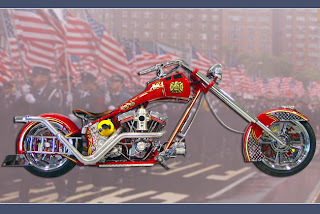 The major American Chopper turn on: the FDNY firebike - creativity to the 't. Lots of interesting detail, and thoughtful elements. The major turn off: the Teutuls go to England. Gave every single American a bad name and reinforced the idea that we are all rubes with lots of money and no sense or decorum whatsoever. 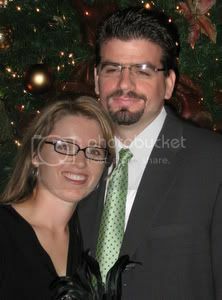 Paul Sr. needs to get in touch with his cuddly side, and Paulie just needs to get married and find a work ethic. Mikey just needs a jesters hat. Point being, I think you can get inspiration from just about anywhere, and I love watching someone go out on a ledge to explore the frontiers of their craft. It makes me wonder what I would do if dropped into one of those shows. How would I change it up, make it better and hopefully even fantastic!! Ultimately none of these are my specific genre - I will never get a tattoo, I don't like fondant, and an expensive motorcycle just isn't in the cards these days. But it does encourage me to keep dreaming and appreciating the arts. Maybe I can't get to the Guggenheim, but I can sit down for 17 minutes of commercial-free artistic expression and pick up a tip or two on dimensional quilting, fire hydrant oil tanks, and the need for a dowel in a tippy cake. Hmmmmmm cake. Anyone want to go to Cold Stone with me! I will give you all of those...maybe not Simply Quilts but that's your thang! Though I have watched several times and never noticed Alex' face...I will have to check that out! Throw Down with Bobby Flay is great! How about Dangerous Catch? How about Design Star? How about "The View?" Those are on my must Tivo list! And whaddup with being home bound? As Royal Carribean says "Get out there!" Oh yeah - I forgot to say I fell for the Teutels when I was up late nursing a newborn Caroline. I was hooked! (I got a henna tattoo once...a tramp stamp...down in Mexico...don't tell!) LA Ink/Miami Ink is cool! I love all the "ink" shows too! Why is that?! Did you see the Miami Ink where Kat goes off the deep end about her appearance? I felt so bad for her. I have seen one or two episodes of Ace of Cakes, but I have this fear it will just increase my craving for cake and make me fatter. I had to stop watching American Chopper because the Dad was such a jackass and I found myself feeling angry all the time while I watched it. I'm with Meredith on "Deadliest Catch"....Dad Nielsen actually got me hooked on that a few years ago. The three shows I Tivo religiously are Gray's Anatomy, Rachael Ray, and So You Think You Can Dance. Okay, sorry but I think the episode of American Chopper when they're in Scotland and they get kilts is rather funny. I love how Mikey's all like, "Well the only person we know out here is Ewin MacGregor." Uhmmmm YEAH... that's the only person I know out there too. Him and Colin Firth. I'll just hang out with those two the next time I'm out there. I have only watched a few episodes of LA Ink. Is Kat Von D amazingly stunning or what? I think that her ability to do portraits is amazing. I often think about getting a tattoo. I also wonder what the Church's stance would be if I had an Angel Moroni done on my ankel. Hey, they say that your body is a temple, and shouldn't every temple come with an Angel Moroni? Inquiring minds need to know.